CLICK HERE to make a contribution right now. Amid this bustling holiday season of giving and celebrations, don't forget to take some time to enjoy nature's gifts...and give back to nature! Mother Nature is bringing us rain for Christmas…and a few days after Christmas, another storm that might also bring snow! With the winter solstice upon us, it also means that the end of 2018, and the New Year is almost upon us as well. VMF's 30th year has been an eventful and encouraging year for continued conservation of the Volcan Mountains--thanks to the Volcan Mountain community. As this year, and this season of giving winds down, thank you again to the many that have contributed this year, and over the decades, to efforts to conserve and protect the 15-mile long Volcan Mountain Range. 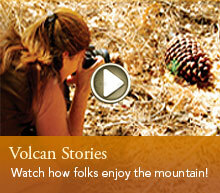 YOU make it possible to continue exploring and enjoying the beauty and majesty of Volcan Mountain…THANK YOU! If you haven't yet made a tax-deductible gift for 2018 to the Volcan Mountain Foundation (or you'd like to make another!) to continue critical conservation efforts and ensure that Volcan's water, wildlands, wildlife--and pristine, natural spaces like these--are protected for all generations..CLICK HERE to make a contribution right now.